I think Pam Howes caught the essence of this time period, the flavor of the era, so to speak. It begins in the early sixties and 18-year-old Eddie Mellor is the drummer for a band called The Raiders. They are just on the verge of breaking into the big time and Eddie is in love with Jane Wilson. They are making plans to get married when he finds out Angie Turner, an ex girlfriend, is pregnant. In those days getting pregnant was a big deal and Eddie tries to do the right thing by giving up Jane and marrying Angie. But in order to become a responsible adult with a wife and child to support, he also has to give up on all his dreams to become a famous rock star. 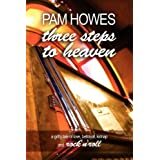 Heartbroken, Jane ends up engaged to someone she doesn’t love, a man who wants to control her every move and doesn’t care how devious he has to be to do it. their happy life is threatened when their new daughter is kidnapped. Though anyone who heralds from the sixties and seventies is bound to connect with this story, I believe even those who are younger will also find themselves getting lost in the pages. Bands may change over the years, but the magic riding behind them never will. The author paints a realistic picture of love and betrayal that holds as true today as it did in times gone by. I loved the journey and invite you to step onto that well known highway called Rock ‘N Roll and enjoy the ride. You won’t regret it. The bargain price of only .99 cents for your Kindle copy makes this an impossible read to turn down. Posted by Denna Holm on July 24, 2011 in Archives.